Two long hot days on the road. Nearly 1,000 miles across the farmlands of America. Every time I get out of the car I question what sane person would leave the Pacific NW and head out across the plains this time of year. Arayo is getting antsy in the back of the car until I get her out for a stretch. She begs to get back in the car again where it is cooler. The campground is sub-par. Unless we are willing to pay $25 for the electricity we won't use we get to park the car and haul our junk into the "primitive" area. I pack my gear in with one hand while wiping the sweat that is pouring off my face with the bath towel that I carry in the other. The nearest water faucet is broken so we have to hike further for the "drinking" water that is the color of clay. I attempt to push Arayo under the water in hopes that if she is wet she will feel cooler through the night. She's having none of it so I take her to the bathhouse thinking I'll sneak her into an actual shower to wet her down. They have one temperature of water. It is hot. I give up. Back in the tent I lay out my mattress and stash my cameras and computer into a corner where i can keep an eye on them. I struggle for 5 minutes to get out of my clothing, which is so sweaty it sticks to my skin and refuses to peel off without a struggle. My flannel PJ bottoms do not look appealing. Arayo has 50% of the tent to call her own. She wants to sleep on my mattress. I try to seduce her back to her side of the tent. She backs up and sits on top of my computer. She is obviously brain damaged. I feel like I'm struggling with an elephant. She has no intention of moving but when she finally does, she goes to the door of the tent and leans against the wall with so much weight I fear she will rip a hole in it. It will be a very long night. I have afforded myself two luxuries on this trip. A really nice mattress and a porta-potty. In the morning I awake to find the potty has totally leaked out in the night and my gear, my mattress, my shoes, my clothing, my dog have soaked up the remnants and fragrances of the toilet. I pack up the mess and call a friend to tell her I think I will be arriving tonight. I suggest she find blinders and nose plugs until we have had a chance to clean up. 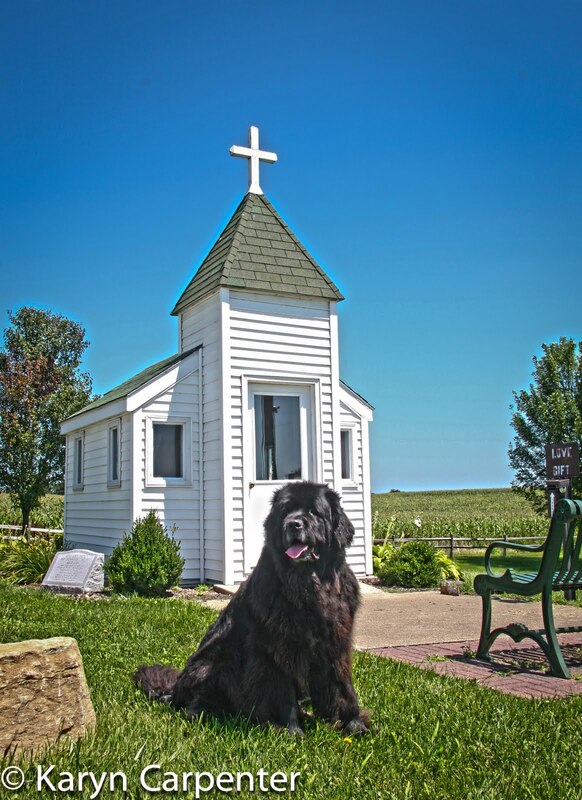 Photo: Arayo checks out The Little Flock Chapel, near Promise City IA. Ok that wasn't a very good thing to wake up to....deep breaths....well maybe not too deep....ha ha....may be a little stinky....take care, my friend. Karyn, I hope you're feeling a little happier today!Is it at all cooler where you are? Take care and give Arayo a hug from me, if it's not too hot! This is a very funny story but I'm sorry you had to suffer so much! So glad you'll have a change of pace when you visit your friend! Glad you can see the humor in it all...well, at least you can share the humor of it with us. This will be one of those times you have to look back on and laugh. In this heat we have been taking showers frequently with the garden hose.